This "Historically Speaking" column appeared in the Exeter News-Letter on Friday, November 18, 2016. We can be rightly proud that Exeter Adult Education is now fifty years old. Tracing its birthday to the 1966 Adult Education Act signed into law by President Lyndon Johnson, Exeter’s program is actually a few years older than the legislation. And the program that Exeter launched in 1964 has its roots in earlier projects in adult education. 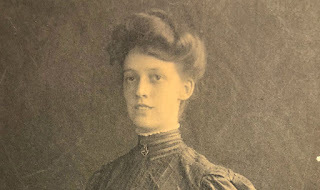 From 1892 – 1900, Exeter had a night school program led by local educator Rosa Akerman. Geared toward the growing population of immigrant workers living in town, Akerman focused on English language skills. Many factory workers in town had to depend on their children to translate for them. Akerman charged five cents per session and her classes were well attended. But rent for a meeting room had to be covered by donations and within a few short years Akerman found that local enthusiasm waned. The students were still interested, but with only factory wages, there simply wasn’t enough to pay increased costs. The next wave of education was also aimed at the immigrant population. In 1917, the Women’s Club and the Civic Club worked with oversight from the town to provide more wide-ranging educational opportunities. Along with English, the program offered arithmetic, algebra, bookkeeping, mechanical drawing, stenography, fancy needlework, woodworking and sewing. Again, though, the program depended on donations. English language was again the most attended class, so there was still a need for this type of instruction. It was during this time that the country experienced something of an immigration backlash. The Bolshevik Revolution in Russia, worker unrest at home and the extreme patriotism of the First World War combined to create an atmosphere of distrust. Citizenship became a badge of honor and people of foreign birth were quick to apply. The days of unfettered immigration ended in 1924 when laws were created that imposed a quota system on new arrivals. With fewer immigrants coming to town, and the onset of economic depression in the northeast, English classes were in lower demand. The night school program faded by the end of the decade. Perhaps it was the GI Bill that inspired the next period of adult education in Exeter. Servicemen returning from World War II were provided with unprecedented access to higher education. In the fall of 1947, the Exeter News-Letter announced the creation of The Exeter Program for Adult Education. “This program, designed for the greater community about Exeter, is in line with a trend throughout the country. Thousands of men and women are going back to school this fall enriching their own lives and strengthening American Democracy by taking courses.” The world had changed, bringing leaps forward in science and technology. This was reflected in the course offerings: “The Monday evening courses will include a laboratory course in photography, a lecture course on chemical and atomic energy, and a hobby group making and repairing furniture. On Tuesday evenings there will be two courses, the first, in public speaking, and the second a lecture on Russia. 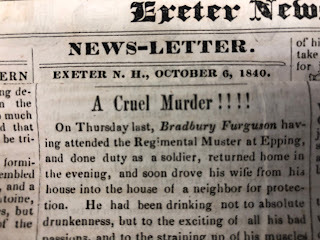 Wednesday evenings will be given over to a series of lectures dealing with great men (sorry, Eleanor Roosevelt, Grace Hopper and Jackie Cochran) and given by eight different speakers.” The instructors, all volunteers, were a mix of Phillips Exeter Academy teachers, Rev. Francis Curran of St. Michael’s church and a few vocational teachers from Exeter High School. At the same time, Ruth Stimson of the Cooperative Extension was offering classes on home economics throughout Rockingham County. The Cold War may have made people somewhat uneasy about the wider world, but they were eager to improve things at home. In the following years physical education was offered. 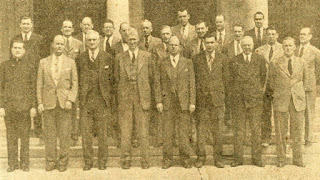 When the program was renewed in 1948, the News-Letter noted that, “too much cannot be said in praise of this venture, or of those responsible for its institution. It was inaugurated for the purpose of bringing to the people of Exeter and nearby towns the opportunity of greater understanding of a fast changing world.” The Exeter Program for Adult Education continued until 1959, when it was decided to suspend the program until sustainable funding could be secured. Even with volunteer teachers, it was difficult to support the program. Adult Education was expanded in the 1980s to include high school equivalency and diploma programs. English language instruction was reintroduced linking our current program with Rosa Akerman’s original vision in 1897. It’s never too late to learn something new – check out the Exeter Adult Education offerings and change your life a little or a lot. Photo: from the Exeter News-Letter, volunteer teaching staff of the Exeter Adult Education Program in 1948. Front Row: Rev. Francis Curran, Elbert Little, H. Darcy Curwen, Academy Principal William Saltonstall, Chairman Phillips Wilson, Superintendent of Public Schools Aura Coleman, Martin Sounders and Robert Kesler. 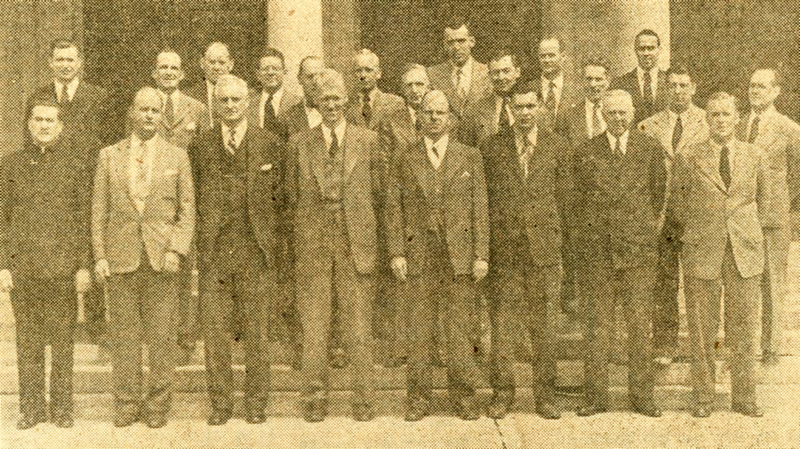 Back Row: John Anderson, Arthur Landers, Oscar Pearson, W. Leonard Stevens, henry Bragdon, Norman Hatch, Jackson Adkins, Dan Fowler, Ralph Lovshin, Gordon Benn, henry Phillips, Robert Bates, Theodore Seabrooke and John Hogg.